Welcome to Backlinks Analysis! We have created this getting started guide to help you get the most out of your ReportGarden SEO Suite account. Let's start! The Backlinks Analysis tool provides an in-depth look at your domain’s backlinks and helps in securing your and your clients SEO link building efforts from Google penalties. Backlinks are an important part in optimizing your SEO. But while good backlinks can have a positive impact on your SEO, poor backlinks can have the opposite effect. If Google sees suspicious backlinks pointing to a website, they may decide to penalize that website for employing black-hat SEO tactics. How can you benefit from this tool? When should this tool be used? Managing your backlink profile: Backlink analysis will assist you in managing your backlinks and to ensure you that none of the backlinks are causing a penalty from Google. 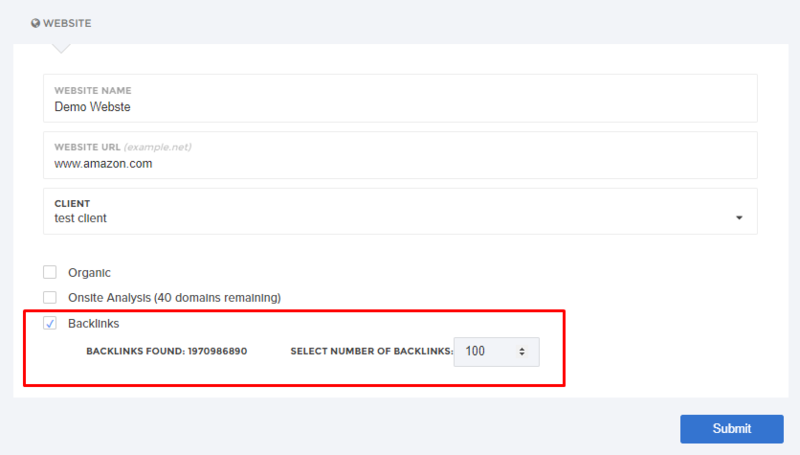 Auditing a client’s backlink profile: If you’re an SEO agency with a new client, you’ll want to get background on their past backlinks. This is a great tool to use to see if they acquired any suspicious links in the past and if you should disavow any of their links to help them dodge a penalty from Google. 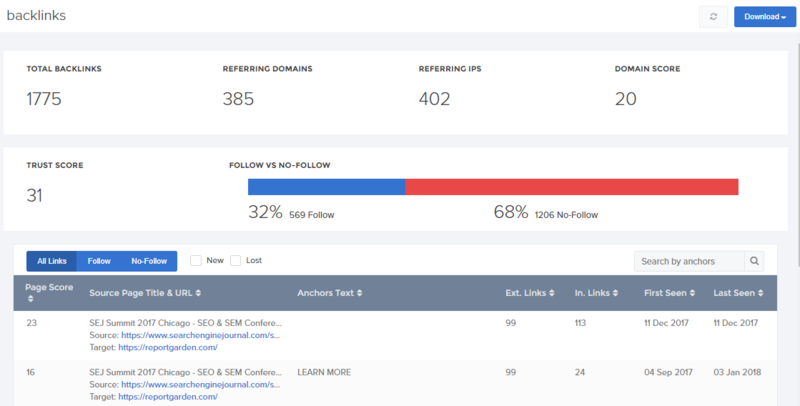 If you find that you have several backlinks that are putting you at risk of a penalty, you can use the Backlink Audit Tool to disavow these links and keep your backlink profile clean. Disavowing links will tell Google not to take these links into consideration when ranking your domain. Know more about how to disavow the unwanted backlinks. A backlink is a hyperlink pointing from one website to other. It is the top ranking factor in Google’s search index. Google considers a backlink from an authoritative website as a sign of trust and uses the quantity and quality of backlinks and referring domains to estimate the trustworthiness of a web page. We analyze the backlinks of a website and provide the insights such as total backlinks count, domain score, trust score, anchor text, follow and nofollow backlinks and many more which are used to competitive research, clients historical backlink analysis and trustworthiness of a website. Click 'SEO' in the left sidebar navigation > Click New Domain button. If your account is new or does not have any domains tracked yet, you will be presented with welcome screen upon login. If chosen SEO, you’ll see a new client page that allows to add your client and later you’ll see a box to add your first domain to be analyzed. Your dashboard is a great way to get an overview of all the website details of your client. Total Backlinks Displays the total number of backlinks pointing form other websites to the queried website. Referring domains The no.of domains directing to the queried URL. Referring IPs The no.of IPs directing to the queried URL. Domain score Domain score is a score that predicts how well a website will rank on search engine result pages (SERP.) Domain Authority scores range from 1 to 100, with higher scores corresponding to a greater ability to rank. no.of backlinks provided from a trusted sites pointing to the domain. Follow Links Follow links are links that instruct search crawlers to follow, and therefore, boost the SEO of the linked-to site by communicating trust and impacting organic rankings. NoFollow Links Nofollow links send users to another site if clicked on, but tell search bots not to crawl the link. Therefore, a nofollow link conveys less of a trust signal that would help the SEO of the linked-to site. These are commonly applied by webmasters on any paid links, user-generated content, or in comment sections of websites. Source page, Title, URL Source URL is the page where a backlink was found on, it’s title and target URL is the landing page of a backlink. Anchor Text Anchor text is the word or phrase displayed in a web hyperlink. This is clickable text and directs the audience from various web pages to your website. Anchor text is the word or phrase (usually in blue underlined text like this) displayed in a web hyperlink. This is clickable text and directs the audience from various web pages to your website. For example, in “Reportgarden: Our product helps online ad agencies create analysis”, “ReportGarden” is the anchor text. The following filters are used when filtering for specific backlinks. Follow: You can see ONLY the follow links. NoFollow: You can see ONLY the nofollow links. New: You’ll see “New” checkbox at the right corner of the “Backlinks analytics table.” As we update the backlinks for every two weeks. Marking this box displays the backlinks within no more than two weeks. Lost: Marking this box displays the backlinks more than two weeks. New and lost backlinks are used in identifying your link building strategy. Search by anchors: Using the search box at the left corner of the “Backlinks analytics table,” you can search for specific backlinks by typing the anchor text in this box. You can see how many new backlinks your competitors have built recently if you enter their domain and select the “New” checkbox. This could tell you whether or not you need to put more attention into your link building efforts in order to catch up or stay ahead of your competitors. With the “Lost” checkbox, you can find backlinks that your competition used to have but are now gone for some reason. These lost competitor links could be great opportunities to reach out and try to get that link to your own website. This can be a great indicator of how much time and effort companies are investing in link building. The "Referring Domain" section in Backlink Analysis gives the countries sending the most backlinks to the domain. We determine the country of a backlink’s origin by the IP address associated with the referring domain. Export the backlink analysis reports in Excel and PDF formats to your clients. Click "Download" button in the right corner of the page. Choose the format and click on it. Open a domain > Click 'Settings' in the left sidebar navigation. Edit Website – In this setting, you can change the name of your website. You cannot change the website URL as the backlink analysis for that domain is already analyzed. If you’d like to change the website, try creating another domain following the same procedure as shown above. All ReportGarden accounts allow an unlimited number of users at no additional cost. This means you can give each of your team members their own account. When you’re on your “Team” page, click the “Invite team members” button on the right side to add new users to your team. Our “Roles” functionality allows you to control which domains your users have access to. For example, if you want to restrict a team member to only accessing the domains of their own clients, you can create a role and assign that role to that team member. You are good to go now:) Try creating a domain here.